For periodontal disease treatment in Kennesaw, Georgia, trust the professionals at Kennesaw Mountain Dental Associates. We are a comprehensive, family dental practice that serves the residents of Kennesaw and the surrounding communities. We offer a full range of general, restorative and cosmetic dental services, including the treatment of periodontal disease. 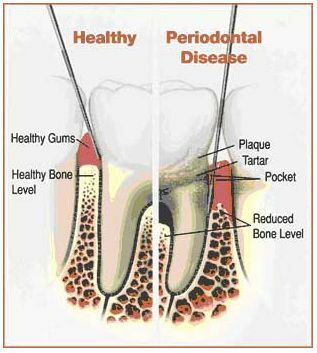 Periodontal disease involves a chronic bacterial infection that affects the gums and the bones supporting the teeth. If left untreated, periodontal disease can lead to serious dental health problems. In fact, periodontal disease is the most common cause of tooth loss among American adults. Treatment for periodontal disease ranges from professional deep cleaning and medications to oral surgery, depending on the severity. If you live in Acworth and are looking for dental care to treat periodontal disease, we can help. The dentist and staff from our dental practice are committed improving the dental health of all of our patients, including the patients with periodontal disease. Together, our dentist and staff work hard to deliver the highest quality family dental care in a warm and friendly environment. By establishing trusting and respectful relationships, we enthusiastically educate our patients for a lifetime of good overall dental health. Common causes of periodontal disease include poor oral hygiene and inadequate brushing and flossing. Smoking or using other types of tobacco products is also a significant risk factor for developing periodontal disease. Getting regular dental checkups, brushing and flossing daily and eliminating smoking and tobacco use are the best defense against periodontal disease. Kennesaw Mountain Dental Associates provides treatment for patients in Marietta who are suffering from periodontal disease. Please contact our Kennesaw Periodontal Disease Treatment Professionals today to schedule an appointment. We accept most forms of dental insurance as well as most major credit cards. We look forward to meeting you and to helping you achieve your best smile.